2 by 3 Heroes: Smoke up, Johnny! The other day I posted the cards I received from Greg at Plaschke, Thy Sweater blah blah blah. (Dude, get a shorter URL!). 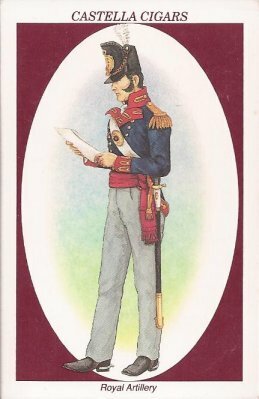 In his cards was the first true tobacco card I received. Technically, that is not true. In the trade sense, I spoke the truth. However, about a month ago, I won an eBay auction for 15 tobacco cards from various years. I snagged it for $3.69 with shipping. I liked the look of the cards, so I bid and won. Never spent the time to show them off, so here goes. Let's see what we can find out about them. This is the largest of the cards in the lot. It's not like the minis we know in A&G, GQ and others. It's more Topps flagship or '75 mini size, but taller. The back talks of some mail in over that expired in 1997. Issued in 1995 as part of a 30 card set. The more boring of the lot you will see. You got your standard animal cards. Top left is a 1971 Cadbury Schweppes Age of the Dinosaurs. The other three are from a tea company Brooke Bond. 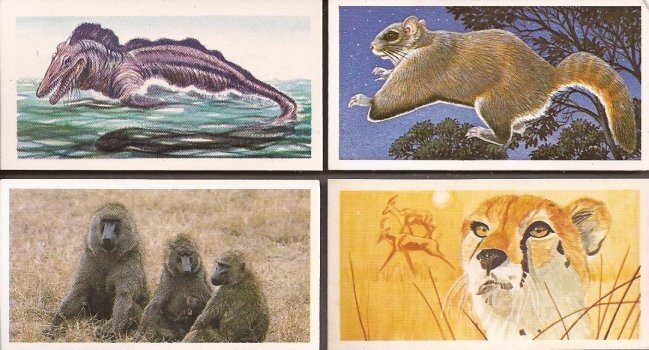 The squirrel is from 1985, the cheetah is from 1978 and the baboons are from 1992. Now were are getting somewhere. The scan really doesn't appreciate these cards. The flag of Canada was issued by Player Cigarettes in 1928 - total set of 50. 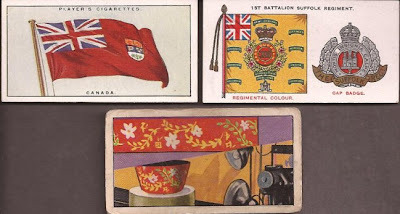 The 1st Btn Suffolk Regiment card in the upper right was issued in 1930 by Players also, one of another set of 50. The bottom card is from a company called Tonibell "Inventions that Changed the World - Periphery Camera", a set that totaled 30, put out in 1963. See that card lower left? THAT is why I bought this lot. Just something about it drew my to the auction. This is a German card issued in a whooping 360 card set in 1934. Yes - Nazi run Germany at the time. Interesting list of stars in that set. The runner next to Dolly is Fanny Blankers-Koen from Holland on a 1992 Brooke Bond Olympic Challenge set. 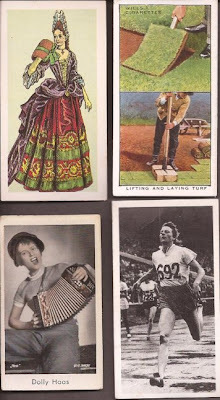 Above Koen you can learn how to lay sod from a Garden Hints series of 50 cards put out in 1938 by Wills Cigarettes. And the beautiful woman in the top left is from the "British Costume" series released in 1967 by Brooke Bond. And the seniors of the lot. These are well loved, by the scans, but really beautiful. On the left is "Famous Crosses - Geddington Cross", a card issued by Stephen Mitchell & Sons, a 25 card set released in 1923. Middle is "Roses - The Queen Alexandra Rose" put out by W.D. & H.O. Wills inside Wills Cigarettes. Lot of card loss on this one, but still a nice card in my book. 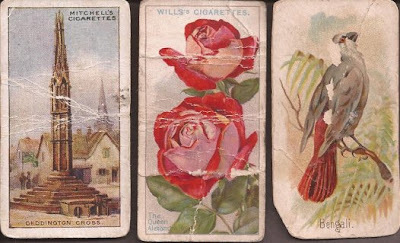 It's a set of 50 cards issued in 1912. She's holding up well for 101. Finally, on the right in a bird that just reads "Bengali" at the bottom. The back is blank, so not a lot to go on. And I don't know if that nick on the lower left of the card is normal - the cut sure looks perfect and not a tear. 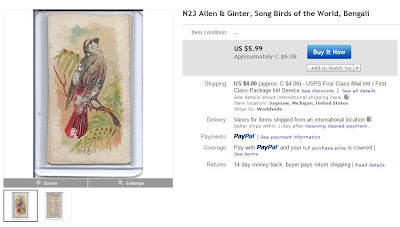 We go to eBay one last time and BAM - it's an official N23 Allen & Ginter! Unfortunately, the "checklist" is missing from the back of the card so the cardboard must have separated at some time in it's life. Plus, that angle cut shouldn't be there. 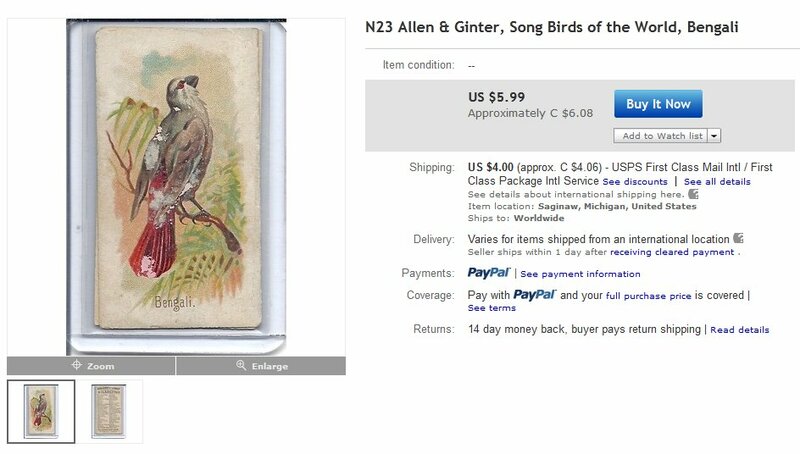 Still, it's from the 1880's, and I am glad to have an actual Allen and Ginter in my collection. Especially since it set me back just a quarter. Not too bad. Maybe I'll get a time machine and take up smoking. love me some original Ginter! Jealous of your rose card. Usually when somebody says that, it's about Pete Rose, not a flower.